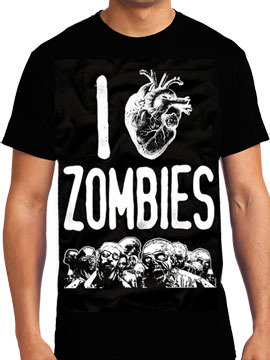 Killers Never Die Heart Zombies mens short sleeve t-shirt features a large image with the words I Love Zombies with an image of a human heart and several zombies depicted below. The back is solid in color. Zombies are fictional undead beings created through the reanimation of a human corpse. 100% cotton. light weight, standard fit. Color: black..